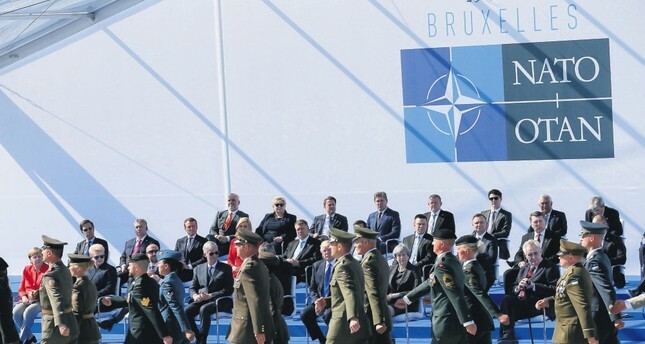 Head of NATO member states watch a march during the inauguration of the new NATO headquarters, Brussels, Belgium, May 25. As U.S. President Donald Trump's first year in office comes to an end, Turkey-U.S. relations remain as strained as ever. Washington's support for People's Protection Units (YPG) militants, the failure to extradite Gülenist Terror Group (FETÖ) leader Fetullah Gülen and its reluctance to cooperate with the Turks on defense issues, along with an ongoing court case in New York that is supposedly dealing with alleged violations of the Iran sanctions, are the top items on the agenda right now. Turkey and the United States reached a point in their relationship, which has been severely damaged by the Syrian civil war, where the term "strategic partnership" means little -- if anything at all. Following the trilateral summit in Sochi, President Trump made an effort to repair Washington's ties with Ankara by telling his Turkish counterpart that he was going to end the "nonsense" delivery of weapons to YPG militants. However, Pentagon officials reiterated their commitment to working with the group, which left the Turks confused. The thinly-veiled disagreements between the White House, the U.S. State Department and the Pentagon on foreign policy are indicative of a broader confusion on policy issues that the Trump administration has been unable to address over the past year. Meanwhile, Turkey continues to welcome President Trump's efforts to work more closely with Ankara, notwithstanding the contradictions in U.S. foreign policy. Therefore, President Recep Tayyip Erdoğan ignored the Pentagon statement and made it clear that the White House was his only counterpart in the United States. He added that his phone call with President Trump was "an encounter where we were able to be on the same wavelength regarding Turkey-U.S. relations for the first time in a while." Noting that he had "discussed, at length," a range of issues including the YPG and FETÖ with his American counterpart, President Erdoğan said the conversation would continue over the next days and weeks. Meanwhile, U.S. Secretary of State Rex Tillerson voiced Washington's concerns over Turkey's rapprochement with Russia and Iran -- interestingly enough, with reference to NATO. Mr. Tillerson, who has been overshadowed by the "de facto Secretary of State" Ivanka Trump, made three interrelated points in a speech delivered at the Wilson Center: The future of the Euro-American alliance, the rise of the Russian threat and the "benefits" of Turkey's NATO membership. The Trump administration's call on NATO allies in Europe to increase their financial contributions, Mr. Tillerson said, was both "a new commitment" and "a redefinition of the alliance." Then, he talked about the Russian "challenge" and argued that, while the U.S. and Europe wanted to "normalize" their ties with Russia, the Russians tried to drive a wedge between Europe and the U.S. through cyberattacks and disinformation campaigns designed to interfere in elections. Finally, he urged Europe to support Washington's plans to contain Iran and made the following remarks about Turkey, "We ask Turkey, as a NATO ally, to prioritize the common defense of its treaty allies. Iran and Russia cannot offer the Turkish people the economic and political benefits that membership in the Western community of nations can provide." One could make the case that reminding Turkey of the "benefits" of NATO membership was more reasonable than calls by several media outlets in the U.S. to kick Turkey out of NATO. However, Mr. Tillerson conveniently ignored the "costs" that his country's misguided Turkey policy entailed in recent years. In other words, U.S. Secretary of State Tillerson, who wants to "redefine" NATO with more European money, is turning a blind eye to the fact that NATO, for lack of a better word, neglected Turkey's vital security interests for years, nor is he willing to admit that Turkey's war on terror has been negatively affected by the alliance's refusal to put the "common defense" principle to work. Ironically, a quick glance at Washington's take on the YPG and FETÖ reveals that it was the United States that undermined the alliance. The current state of affairs between Turkey and NATO not only raises questions about the reliability of this so-called alliance, but also turns NATO capitals into sources of anti-Turkey sentiment and fuels anti-Westernism in Turkey. It is no secret that NATO desperately needs to reflect on Turkey's security problems, as the country faces more serious threats today than at any point since the Cold War ended. In the face of a wave of chaos and terror coming from Syria and Iraq, Ankara has been left alone by its self-proclaimed allies. Every passing day, more Turkish people believe that NATO fails to live up to its responsibilities toward Turkey with regard to preventive and traditional security. To make matters worse, the harboring of PKK and FETÖ militants by European governments at a time when the U.S. provides shelter to Fetullah Gülen and supports YPG militants raises questions about the necessity of the NATO membership. Under the circumstances, the right way to redefine NATO is to look out for the vital security interests of all allies --as opposed to "reminding" them of the benefits of membership.